Last week, American Libraries Live held a discussion hosted by Jason Griffey with contributors Maurice Coleman and Robin Hastings. They discussed what they mean by mobile, gave examples of some of the ways libraries are using mobile technologies, and answered questions posed by viewers. You can view a recording of the session by clicking on the image below or directly via this link. The importance of knowing your users, the technologies they use, and things they would like to use their mobile devices for. Google Analytics was recommended as a tool to help with this as it includes information on devices and browsers used to access your website. Also consider those who aren’t currently using the library. Mobile services may be one way to reach out to the people who don’t currently use library services. Users tend to expect to be able to use their mobile devices for simple discovery of resources (e.g. catalogue), location and opening hours information, and to contact the library. Some libraries are experimenting with using mobile devices for circulation (all speakers agreed that it would be great to be able to offer users the ability to borrow items by using their mobile devices to check them out). Mobile payments are gathering traction and are likely to be used more in future (e.g. Square Register and Square Wallet). This entry was posted in Events, Mobile devices and tagged ALA, ALLive on February 18, 2013 by Jo Alcock. I recently attended a webinar hosted by the American Library Association Library and Information Technology Association Mobile Computing Interest Group. I created a Storify to share the presentations and related resources. Unfortunately I’m not able to embed the Storify but you can access it from the link below. 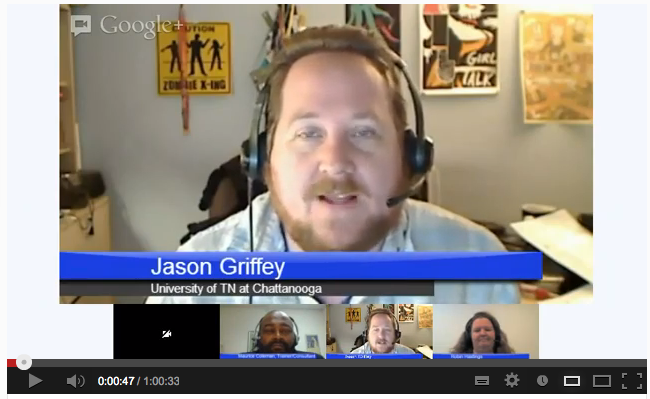 This entry was posted in Events, Mobile devices and tagged ala_lita, gamification, mcig, responsive web design, webinar on January 25, 2013 by Jo Alcock. Library mobile apps – what features do they have? Myself and one of my colleagues at Birmingham City University are interested in finding out what functionality is currently being offered by libraries through mobile apps. If your library has a mobile app, please complete our very short survey to share with us what your mobile app includes. We’ll be sharing the aggregated results on the blog afterwards. This entry was posted in Evidence gathering and tagged apps on January 9, 2013 by Jo Alcock. 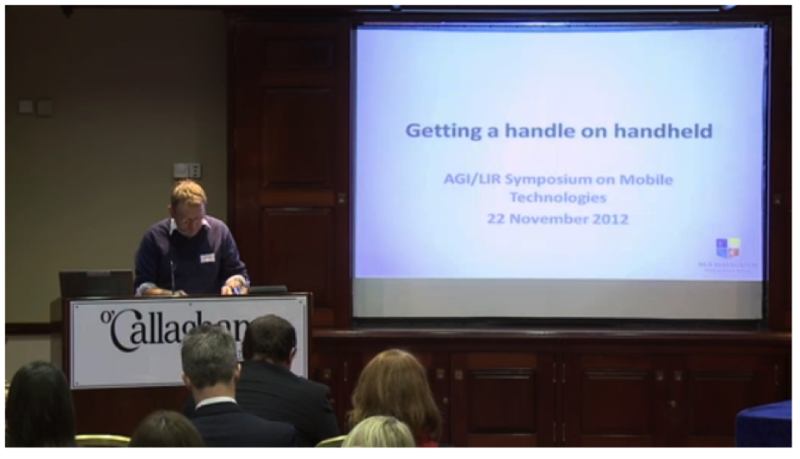 Two powerhouse communities of librarians in Ireland, LIR and the Acquisition Group of Ireland joined forces to host Mobile Technologies Symposium recently in Dublin in November 2012. Featuring a variety of interesting presentations from practitioners on both sides of the Irish Sea, the high attendance was a sure sign that it was a topic of interest to those of us who work in libraries (and beyond). Throughout the talks and from informal discussions, there really was a genuine sense that ‘mobile’s time has come’ – so many of the tools are in place, however what appears to be frequently lacking was the sense that adequate resourcing could be put in place. I had the honour of speaking in an introductory capacity, with “Getting a handle on handheld” and I was at pains to stress the point that mobile is a service option – it is not something that we should simply do because we can. Thankfully my talk and this point in particular seemed to be quite well received (who wants to die on stage!) and the evidence from those giving case studies seemed to indicate both a considerable amount of thought having gone into the provision of a service, but also thinking seriously about the ‘why’ of it. Next up was Mobilising your e-content: scholarly information on the move from Alison McNab – who is undoubtedly familiar to many as one of the more prominent voices in this area. Alison’s talk could scarcely have been more comprehensive and strikes me as a perfect stepping on point for anyone looking to dive into this arena. (Warning – the arena, being mobile, may have moved so look before you leap). 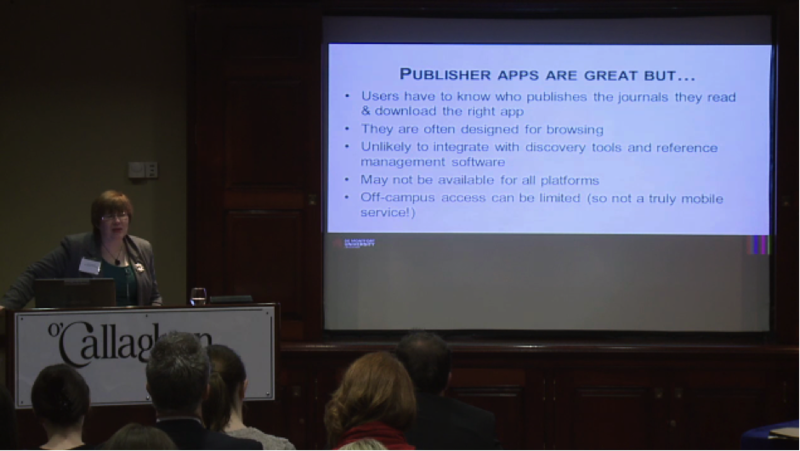 A critical part of Alison’s presentation focused on the gulf that exists between what commercial vendors and publishers are supplying and what we as librarians, and what our users need. That gulf is vast. Alison’s presentation was complimented in many ways by Ronán Kennedy from NUI Galway who gave us “Who’s doing what: a quick guide of how providers are approaching mobile content”. Ronán’s typically pithy presentation showed what his institution are doing, but also placed it in the context of broader mobile solutions – again including those offered by vendors generally. UCD, as Ireland’s largest institution could well be expected to be on the cutting edge of developments in this area and they certainly appear to be moving in the right direction, judging from Joshua Clark and Samantha Drennan’s presentation on “The Mobile Library at UCD – Achievements and Plans”. Talking to us about developments in UCD and beyond, they really conveyed a sense that the sea change towards mobilised content is growing ever stronger. UCD have taken the opportunity to include mobile optimised content when redesigning their whole web experience – a decision which presumably will continue to pay off for them for some considerable time. In terms of policy – Ros Pan (also of UCD) spoke about “library apps: their place in an overall mLibrary strategy and options for creation” Ros is working on a project which will endeavour to give a national snapshot of where we are in terms of library apps and mobilised content. No doubt we can learn from colleagues in the UK who have already undertaken (and benefited?) from a lot of this type of work. 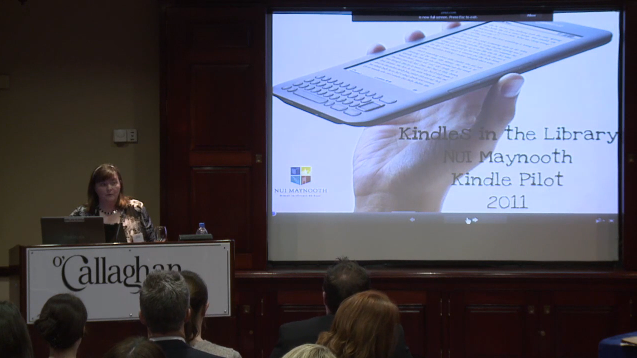 NUI Maynooth was ably represented by Louise Saults, who spoke about a very successful NUIM Library Kindle Pilot project which we put in place in 2011 and which is still going strong. The success of this project, to my mind proves that it doesn’t have to be entirely ‘bells and whistles’ – that sometimes the less elaborate option is actually the service solution which our users needs. That said, the success of this project suggests to me that our users might be ready for another, new solution and it’s up to us to find one that suits them. David Kane, of Waterford Institute of Technology and Jil Fairclough, of Brighton & Sussex Medical School gave talks which, while arguably more ‘niche’ were no less interesting for it. Jill spoke about “putting digital mobile resources in the hands of medical students – impact, lessons learnt and the future” which detailed findings of the MoMEd project. This project seems to have been very comprehensively planned and carried out and, from a technology view point, it was fascinating to see the challenges which occur when a project straddles a few years – the tech involved in delivering content has changed dramatically – from PDAs (remember them?!) to Smartphones. David spoke about the creation of a Plug-in for Moodle and how best to optimise their intuitions’ services in this regard – for mobile and beyond. Andrew Walsh, University of Huddersfield, is very familiar to many for his participation in Lemontree and he spoke about this in his presentation on “Lemons, badges, fun and games: Gamification and Libraries”. Having followed the progress of this work from afar it was great to get some detail from one of the central players. What was particularly interesting to me was the fact that part of the potential outcome of the game is to affect user attendance patterns – for example to incentives coming in at certain times. In conclusion the symposium was excellent – and it would have been hard to give greater illustration of the sheer breadth of work that can fall under the mantle of ‘mobile’. Of course this diversity brings even greater challenges in many ways, but also indicates to me, that there is huge scope for librarians and others to think very creatively in terms of provision of a new type of service – a service which our users do appear to want. It would have been nice to have seen somebody discussing Augmented Reality in a library context – this will have to go on the post Christmas to do list. Which will, of course be on my Smartphone! This entry was posted in Guest blog posts and tagged agi, events, lir, mlibs on December 17, 2012 by Jo Alcock. The final report from the results of the end of project survey (responses collected July-August 2012) has now been published. You can view the series of blog posts for overviews on specific areas, or view the full PDF report online (also embedded below). This entry was posted in Evidence gathering, Project news and tagged end of project survey, fact finding survey on December 10, 2012 by Jo Alcock. This is part of a series of blog posts on the end of project fact finding survey. Other responses included collaborative projects (with other organisations or others within the organisation who may be more knowledgeable), dicsussion with/learning from colleagues, in house training/awareness sessions, creating your own m-library initiative, video demonstrations, and support from suppliers. Practical demos and sessions are always the most fulfilling so you can see the technology in action. This is what people remember. Good case studies in relevant types of libraries (in our case engineering and industrial) might help. Hopefully this blog will be one place to help signpost to these sources of information. This entry was posted in Evidence gathering and tagged end of project survey, fact finding survey on December 7, 2012 by Jo Alcock. 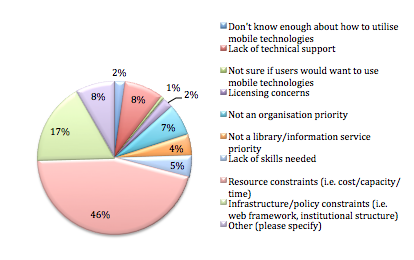 Fortunately, the majority of respondents (72%) felt confident or very confident about implementing mobile technologies in the libraries. However, 26% did not feel confident, and 2% did not feel at all confident. The responses emphasise the importance of having these elements in place in order for the staff to feel confident to implement mobile technologies. This entry was posted in Evidence gathering and tagged end of project survey, fact finding survey on December 6, 2012 by Jo Alcock. We added some additional categories to the question about barriers/challenges based on the open responses to the last survey. We also asked an additional question about the primary barrier to discover which are the biggest barriers at present. As shown, resource constraints are the primary barrier for a large proportion (46%) of respondents. 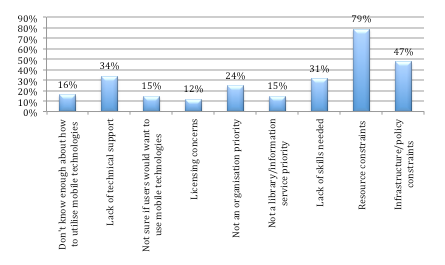 Infrastructure/policy constraints are the primary barrier for 17% of respondents, whilst licensing concerns, lack of technical support and not an organisation priority are also primary barriers for over 5% of respondents each. This entry was posted in Evidence gathering and tagged end of project survey, fact finding survey on December 5, 2012 by Jo Alcock. 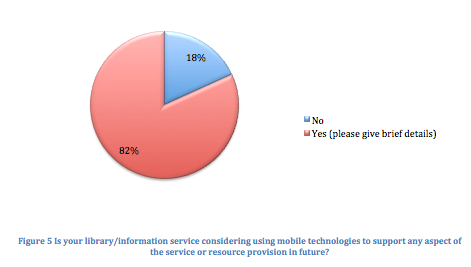 Interestingly, when asked if their library was considering using mobile technologies to support any aspect of the service or resources provision in future, less people responded yes (81.8%) than in the first survey (90.4%). This still shows the majority intend to incorporate mobile technologies in future plans, though may represent a slight decrease in planning (or could be due to a different sample of respondents. Is your library/information service considering using mobile technologies to support any aspect of the service or resource provision in future? Many of these are similar to the existing or current m-library initiatives, though it is interesting to note a few additions to the usual list such as mobile web chat, strategy development, near field communication and radio-frequency identification, supporting bring your own device, and bibliographic management. This entry was posted in Evidence gathering and tagged end of project survey, fact finding survey on December 4, 2012 by Jo Alcock.